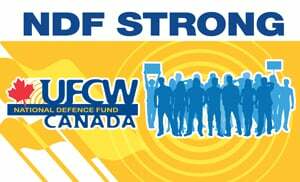 Quebec City – November 4, 2017 – UFCW Canada Local 501 members working at Molson Coors Canada in Quebec have voted to join the National Defence Fund (NDF). The members work in the distribution centre at Molson’s, and they joined the NDF to gain the protections of Canada’s leading strike and lockout resource. Established over 30 years ago, the NDF makes sure that in the event of a strike or lockout, bargaining units that subscribe to the fund have the financial and logistical resources needed to fight tough employers. The NDF also provides members with additional strike benefits, on top of their regular strike pay. Employers know that members of the NDF have extra strength to take on a strike or lockout, if required, in order to achieve a fair agreement. "I would like to congratulate the members at Molson for standing up for their rights and voting to join the NDF,” says UFCW Local 501 President Alain Lachaîne. "With the extra resources that the NDF provides, the Molson members can rest assured that they will have added bargaining strength heading into future negotiations with their employer,” Brother Lachaîne adds.